You’ll all be pleased to know that yesterday I finished uni, hooray!! This means that I can start getting back into the swing of blogging more regularly, as it has been difficult balancing out everything but I didn’t want to just abandon my blog as I enjoy it too much. Anyway, I thought i’d get up another WOMF as you guys have really enjoyed the previous ones. As i’ve been so busy recently, my appearance has kind of taken a back seat as i’ve literally been rocking my mum jeans for the last three months with any random top thrown on top, and as for my makeup i’ve kept it very minimal and have stripped it right back to the basics. Over the past few months, concealer has been my best friend and the Rimmel Wake Me Up Concealer is the one i’ve been slathering on to try and hide my bags that my boyfriend so kindly pointed out the other day, but seriously it’s a great concealer. As for foundation i’ve been keeping it quite light, and the Erborian BB Creme has been my go to. I’m sad because I actually squeezed the last little bits out of the tube yesterday, so that definitely means a repurchase with happen when pay day comes round. As always, finishing off my base with the Rimmel Clear Complexion has been a must to keep any shine at bay. As i’ve been trying to keep things quite minimal and fresh, using The Body Shop Honey Bronzer to lightly contour and add a small amount of dimension to my face has worked really well to make me look less ghost like. As always, i’ve been using my trusty HD Brows Palette to fill in my brows, as I find they just make your face look more put together. Moving onto eyes, and it’s been really strange for me to not be wearing any eyeliner recently but i’ve just been loving the almost bare eyes kind of look and the Smashbox Full Exposure Mascara has been my go to. It works so well to coat and lift the lashes without them looking too un-natural. As i’ve been keeping the majority of my makeup quite minimal, i’ve been opting for a bold lip to bring it all together and i’ve been loving the Revlon Color Burst Matte Balm in the shade ‘Unapologetic’. Usually I wouldn’t go for a shade this bright, but with a tan and the sun shining I can see myself totally rocking this! 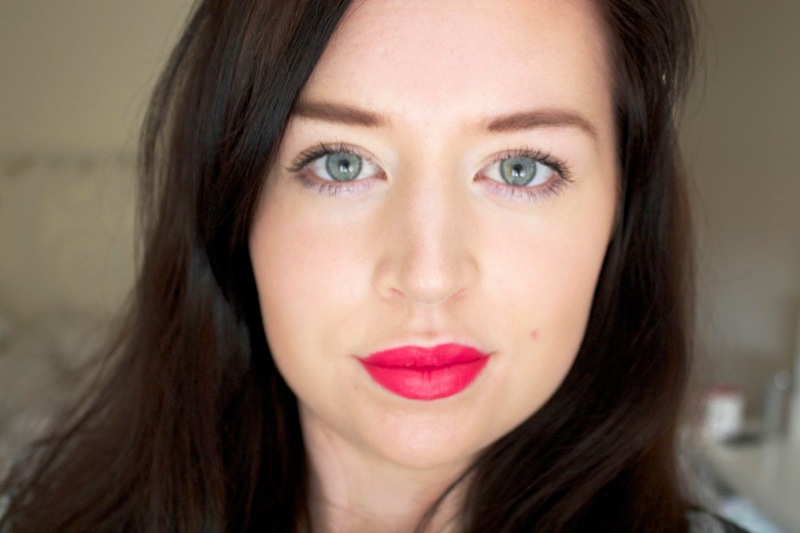 Have you been opting for a bright lip/minimal face combo recently?